Making a chandelier work in a room is all about getting the proportions right so that that it doesn't look too big or small. A chandelier should balance a room, not overwhelm it or be so small as to get lost in it. When choosing the size of your chandelier, take the dimensions of the room and measure the distance between the walls and the height of the ceiling. If your chandelier is to be placed over a raised surface like a dining table, then measure the distance from the top of this surface to the ceiling. Measure also the length of the chandelier itself, including any flex or central ceiling post and from these measurements, you will have an idea of the correct size of chandelier to suit the room size. 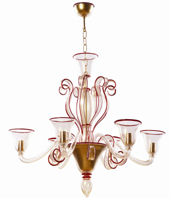 Having gauged the correct size for your chandelier, you are then able to select the appropriate style. Choose one that will match or complement the existing décor and furnishings within the room. Note that chunky wrought iron, contemporary chandeliers may overpower a pretty backdrop and traditional chandeliers that are too large, may dominate a space. Get the combination of size, material and style right and your choice of chandelier, whether contemporary or traditional, is sure to impress. 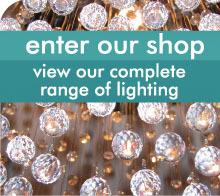 Contemporary Chandeliers – click here to browse our range of designs. 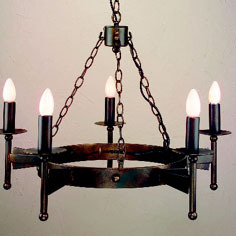 Traditional Chandeliers – click here to browse our range of designs. 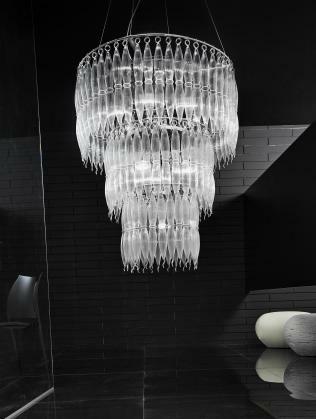 Contemporary chandeliers made from crystal work very well in bright, sunlit entrance halls. The sun’s rays catch the crystals, making them sparkle and send coloured light in all directions. The effect can be truly magical and create a real talking point. For the darker, more traditional wood panelled entrance halls, a chunky wrought iron, black metal or brass multi light chandelier will work very well. 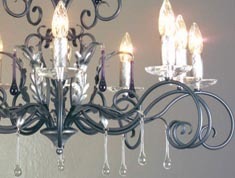 It will be in keeping with the décor and add to its dramatic effect as you enter any property. Your choice of chandelier for the living room will again depend upon room size, ceiling height and décor and the kind of lighting mood you want to create. You will need to consider if you want to dim the lighting what type of bulbs are used and if the fitting has low voltage transfomers. As this is usually the room where you spend most of your time in the evening it is important to pick something special.You may like to consider a metal, brass, crystall, or glass chandeleir.. Your choice should be influenced by the other items of furniture and colour schemes displayed in the room and will then complement and balance these, to create the finished look. When choosing a chandelier for the dining room, take into account the style and colour of your dining room furniture and colour scheme. Think about how opulent you want the fitting to be, as it will be a talking point in the room. A traditional bras chandelier would complement chunky dark wood furniture whereas, delicate furniture made from lighter coloured woods will require something a little more subtle. 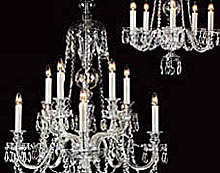 For those of you who adore chandeliers in all rooms you will need to review the space available. And ensure that in rooms where there is water the fitting is IP rated to stop any water ingress. There is now a great range of IP rated chandeliers which also comply with current regulations for fittings installed within bathrooms, so they not only look beautiful you can get them signed off by your electrican after installation. For bedrooms the sky is the limit nothing looks more spectacular that a beautiful chandelier in a boudoir Just make sure the fitting is the right size for the room and consider where you will position the fitting. Chandeliers also have there place in kitchens especially where there is a join kitchen and living area. Functional spots and chandeliers can be used in unison to ensure the practicalities of working areas are balanced with the beauty of a chandelier.